Various codes of conduct were reworked after the financial crisis because the question arose whether they had been sufficiently worked upon and complied with. The control of the conversion of the codes was also made stricter in practice. A code of conduct is communicated to all employees via the electronic channels and training sessions. 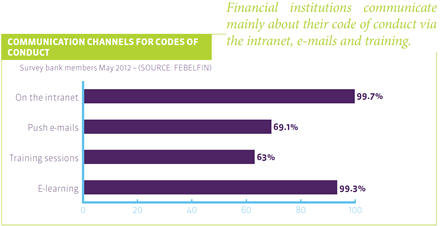 Most financial institutions had already drawn up a code of conduct for their employees long before 2007. It specifies principles that determine which conduct is acceptable and which is not. A code of conduct often goes further than what is mandatory. During and after the financial crisis, however, the question arose whether the codes of conduct were sufficiently complied with everywhere. In response to that criticism, the financial sector reworked various codes of conduct. Moreover, the financial institutions have tightened control over the way in which the codes are put into practice. 10 principles for issuing and providing consumer and mortgage loans in a responsible manner, etc. The various codes of conduct are part of the sector-level study packages of Febelfin Academy, the training institute of the financial sector. Ethical conduct is also one of the strategic priorities of each individual financial institution, and the bar has been set at the highest level: responsible and ethical banking is therefore a commitment of the financial institution at the level of the CEO, who will have the idea implemented at all levels of the organisation. Usually all employees sign the code of conduct, after which it is placed on the intranet. In 94% of the sector (15 out of the 19 institutions surveyed) training or e-learning sessions are organised on this subject, which are repeated at fixed times. All the surveyed institutions that have drawn up a code of conduct also have a whistleblowing system that makes abuses known. 97% of the sector (16 out of the 19 institutions surveyed) has an internal system; one institution calls on an independent external body. 30% of the sector (7 out of the 19 institutions surveyed) has gone one step further and has founded an ethical committee that employees can contact if they are confronted with a conflict between the values of the institutions and the instructions they receive, or the imposed objectives.